From time to time, our body needs a natural boost, something that will restore its optimal work, and improve the functions of the body organs. This can be achieved through a natural cleanse, which eliminates all toxic substances from the body. The body has natural means of eliminating toxins through the liver, urine, sweat, and feces, but a body cleanse further helps the liver neutralize toxins and remove them from the body. Additionally, even though the terms are used interchangeably, there is a difference between a cleanse and a detox. A detox diet eliminates unhealthy foods from the diet and focuses on certain foods with detoxifying properties, while a cleanse eliminates unhealthy foods and concentrates on eating whole, healthy foods. Lemons detoxify the body and strengthen the immune system since they are full of vitamin C and other antioxidants. They improve the function of the liver and gallbladder and improve the digestive process. A glass of warm lemon water in the morning can do miracles for your overall health. Its anti-inflammatory components and high levels of antioxidants and flavonoids cleanse the kidneys, liver, and gastrointestinal tract. Tomatoes are rich in vitamin C and other nutrients. They improve heart health and are high in lycopene, a potent antioxidant that prevents free radical damage and cleanses the body. Onions detoxify the system and treat nasal congestion, indigestion, asthma, and blood toxicity. Grapes are full of antioxidants that help digestion, improve the function of the liver, cleanse the blood and the tissues, and regulate cholesterol levels. Asparagus detoxifies the body through the urine and supplies it with numerous important nutrients. Pomegranates are high in vitamins, antioxidants, and fiber, so they prevent free radical damage, relieve diarrhea, cleanse the body, and protect against numerous diseases. Apples are rich in fiber, so they help digestion, prevent food cravings, purify the blood, regulate cholesterol, and improve psychological health. Artichokes help digestion, cleanse the body, fight water retention, and restore the function of the liver. 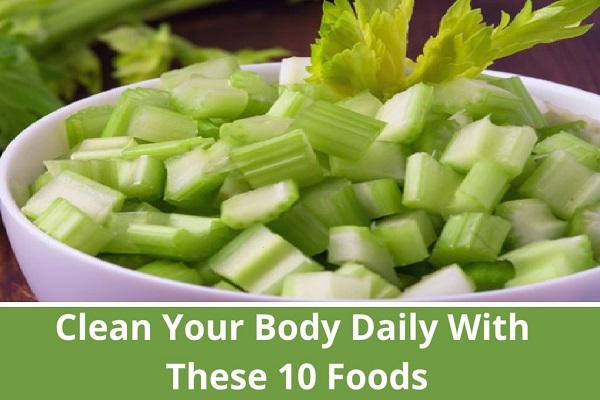 Celery detoxifies the body from waste and toxic buildup and acts as a powerful diuretic that relieves water retention. It helps digestion and improves blood circulation.